So yesterday, I spent a while typing up a fancy-schmancy post about my experience at Blog Better Boston this past Saturday. It was pretty good and full of pictures (some mine, some borrowed). So yeah, I was working on it on my computer. I remembered there was one photo I wanted to add (that was on my phone)… so I went to my WordPress app on my phone, added the photograph, and uploaded it. What I didn’t realize was that because none of the changes on my computer were saved, uploading it on my phone pretty much reverted it back to the original post (which was pretty much just 6 pictures and about 3 sentences). Needless to say, that was a fail on my part. Last night my boyfriend’s parents had us over for a clamboil, with his sister and her boyfriend too. We ate fresh picked Rhode Island clams and it was absolutely glorious. I loved everything about it. I’m so lucky to have such great people in my life. Since food is obviously quite important to me, I should mention that I am already so excited to eat dinner tonight. Mr. O is making us steak and garlic potatoes. Plus, the steak has been marinating in Worchestershire sauce and I am pretty obsessed with that. How lucky am I? Seriously. I’m so lucky. I have this pretty bad habit of trying to downplay things that are bothering me, etc. 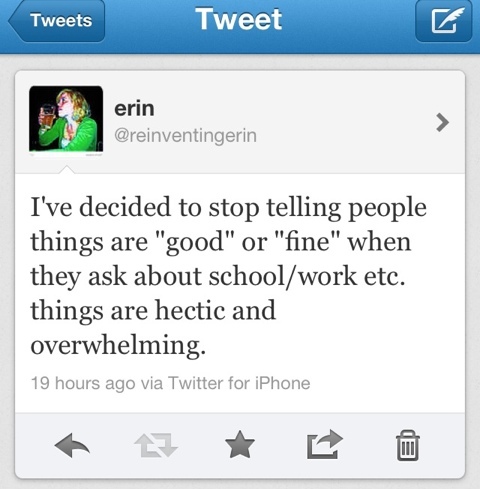 When people ask how I am I usually respond with “fine” or “great, thanks!” Which in some way is correct. I’m happy, in love. I’m fortunate to have a great job. I go to a great school. I surround myself with good people. But I need to be a little more honest with myself and other people when life feels overwhelming. I need to learn to ask for help or support when the going seems tough. And people also need to understand where my current priorities are. I’m graduating in July. Which means my thesis needs to be finished within this month. In May, I will need to get my thesis approved, and then as soon as those shananagans are over, I have more to do for school. I need to prepare for my workshop in which I’ll be a student this summer. I need to prepare for my workshop in which I’ll be a TA (teaching assistant) this summer. I need to create, coordinate and prepare for my student seminar. I need to pick out what I am going to read for my student reading. I need to pick two lines of my writing (out of my entire thesis, just two lines!) which will be read as I walk across the stage on graduation day. I need to WRITE A FRICKEN graduation speech. And, yeah. I think that is about it (for school). So, needless to say: I’m feeling completely overwhelmed. I know I can do it. I’m confident I’ll figure my way through this, but I’m not going to short change myself any longer. I love school, but it isn’t easy. It shouldn’t be. This entry was posted in Family, Fellow Bloggers, Graduate School, Mr. O, Reading & Writing and tagged Blog Better Boston. Man, I hate when that happens … when you write a whole, long post with pictures and all, and then the post gets deleted. Isn’t there like an auto-save function or something.